Bright colours and a fun background are a great combination for stunning scrapbooking ideas. In this layout I have created a playful and happy house-shaped background using simple shapes and exciting papers. It's the perfect backdrop for joyous family memories at home. This layout was created using Provo Craft Dots paper, Provo Craft Stripes paper, Sky Blue Bazzill cardstock, pink cardstock, orange cardstock, white cardstock, pink pen and Bo Bunny Family Memories Twill Words stickers. 1. Use the Sky Blue Bazzill cardstock as your background. 2. Cut a piece of Provo Craft Dots paper measuring approximately 17cm by 23cm. Glue to your background at an angle (as shown in the layout above). Trim away any excess so you retain a straight bottom edge. 3. Cut a square of Provo Craft Stripes paper measuring approximately 14.5cm by 14.5cm. Cut in half diagonally to form two triangles. Mat one triangle with pink cardstock and adhere at an angle towards the top left corner of your page, as shown in the layout above. You should now have something resembling a house. 4. Cut a piece of Provo Craft Dots paper measuring approximately 3cm by 5cm. Glue at an angle on the left side of the roof of your house, as shown in the layout above. Your background is now complete. 5. Select a border sticker from Bo Bunny Family Memories Twill Words stickers and mat with white cardstock. Mat again with pink cardstock, but this time, cut a curved edge, as shown in the layout above. I used a template to create this effect, but you can also use a punch, decorative scissors or draw your design freehand. 6. Use a pink pen to draw a dashed border around the curves of the pink cardstock. Being careful not to smudge the ink, adhere your border horizontally across your page approximately 1.2cm from the bottom edge. 7. Mat your photo with white cardstock. Mat again with pink cardstock and again with orange cardstock. Adhere to your page, as shown in the layout above. 8. 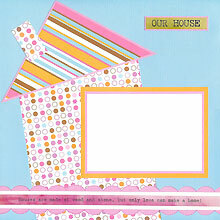 Finally, mat the 'Our Home' sticker with pink cardstock and adhere towards the top right corner of your page.